Issues relating to what we eat are in many cases similar to concerns about what our pets eat. “There definitely is a link,” says Dr. Karyl Hurley, director of Global Scientific Affairs for Mars Petcare, who helped organize the Waltham International Nutritional Sciences Symposium. 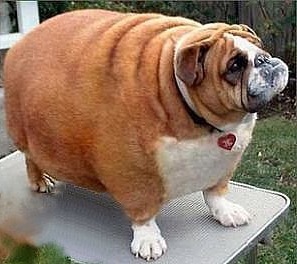 There are several ways we can help our pets fight obesity. 50% of pets in the U.S. are overweight, and a lot of that comes from over-treating. One dog biscuit can have up to 50 calories, so the weight can really add up fast! Selecting the right treats is just as important as selecting the right pet food, especially for pets who need to lose weight. A dog treadmill can give your dog a great workout regardless of weather or environment, allowing you to maintain a consistent exercise regimen. A treadmill provides increased muscle definition, toning, improved vitality, increased life span and can help curb destructive behavior or excess energy often associated with the lack of regular exercise. Dog treadmills provide a way for you to exercise your pet even when the weather is bad or it is inconvenient to take them out for a walk. You Got A Puppy Mill Dog – Now What? Adopting and caring for a puppy is always a rewarding experience. In exchange for food, shelter, exercise, and regular veterinary care, your pet offers loyalty and companionship for the remainder of his life. Dogs that have lived in puppy mills, however, pose a unique challenge for owners. The treatment they received at the mill will likely have made them distrustful of people, and fearful of anything that is unfamiliar to them. Owners who adopt such dogs must take a few extra steps toward making them feel comfortable and secure in their new homes. In this article, we’ll describe how puppies are treated in mills so you’ll understand the reasons such pups are hesitant and fearful of others. We’ll also describe the typical behaviors puppy mill dogs exhibit once they’re rescued. Lastly, we’ll provide a few suggestions for helping your puppy feel comfortable within your home. Puppies are treated poorly in mills. Their physical and mental health take a back seat to revenue. The mill generates this revenue by breeding the pups in their care. But there is a key difference between the breeding activity that takes place in a mill, and that which is done by professional breeders. Professional breeders do everything possible to minimize genetic problems in the puppies they breed. Mills take no such precautions. Instead, they breed pups without consideration for the likelihood that defects may pass to the litters. For this reason, many of the puppies born from this process are saddled with eye, dental, and joint problems. The pups at the mill are usually housed in overcrowded pens. The living conditions are often dirty to the point of being unhygienic. Moreover, the dogs seldom receive the basic essentials they need to stay physically and mentally healthy. They rarely see the sun, or have access to a constant source of clean air. When a puppy is adopted from a mill, the transition to a “normal” life can be jarring to him. You may notice behaviors in him during the first few days in your home that seem odd. Keep in mind that everything is new and potentially frightening to your new pet. When you bring him into your home, he may appear especially hesitant. This is because he has lived with fear his entire life. He has learned to dread the unfamiliar. First, establish a room – or part of a room – as his personal den. Place bowls for food and water in this area along with newspapers on which he can urinate and defecate. Having an area to himself will make him feel safe, and slowly build his confidence. Second, after a week has passed, begin acclimating him to a collar and leash. Place both on him for short periods, and let him drag the lead as he roams throughout your home. This will help him become accustomed to the feel, and prepare him for going on walks. Because your puppy’s exposure to the outside world was so limited while he was at the mill, he may be easily startled by unfamiliar noises. For example, the sound made by a vacuum cleaner may frighten him. A toaster, television, and blow dryer may also cause him stress. Desensitization training will prove invaluable for helping him become used to hearing these sounds. This type of training takes time and requires patience. But it’s the most effective way to minimize your puppy’s fear and stress of routine noises that occur in your household. Once your dog begins to feel safe and secure within your home, he’ll explore on his own. He’ll start to peek into other rooms to discover what lies beyond the confines of his personal den. Over time, he’ll gain confidence regarding his place within your life, and look to you as his best friend. Like most people, dogs love food. They’re willing to sacrifice their dignity in order to obtain it. If food is not given freely, but instead eaten in front of them, they will beg. Some will do so relentlessly. A begging dog can be particularly frustrating for his owner. He’ll sit and stare longingly at his owner’s plate, hoping to receive a tasty morsel, regardless of size. Unfortunately, many people acquiesce under the pressure, and give their pets table scraps just to send them away. This is a bad idea for a number of reasons. Below, we’ll explain the side effects table scraps can have on your canine; you’ll learn the reasons you should avoid providing them. We’ll also describe a few methods you can use to discourage the behavior, so you and your family can eat in peace. Commercial brands of dog food are specially formulated with the nutrients your pet needs to stay healthy. The vitamins and minerals contained in these brands are necessary for whatever stage of development your canine is in. Table scraps rarely provide the same level of nutrition. Instead, they usually deliver excess calories, which are likely to cause weight problems for your pet. And that leads to avoidable health issues. Another reason to avoid giving your dog table scraps is because doing so can lead to digestive problems. Even though your pet will eat anything placed in front of him, his body may be unable to tolerate some types of food. Also, given a steady diet of people food, your canine may eventually become fussy with his own meals. He’ll essentially acquire a taste for the foods you feed your family. And that’s when his begging will begin to take on a new level of urgency. This method removes your pet’s opportunity to beg. You can use a couple of different approaches depending on whether you would like your canine to remain in the room in which you’re eating, or to stay out. If you’d like his company in the room, place a lead and collar on him, and secure him to a nearby chair or other piece of furniture. He should be kept far enough away from the table to minimize the temptation to beg. Consider providing a chew toy to give him something to do while you and your family eat. You can also bar him from the room, which can be done easily with a pet gate. Confine your dog to a room elsewhere in your home, so he’s unable to watch you eat through the gate. This will prevent him from whining to gain your attention. This method requires more time and patience since there is training involved. The goal is to give your dog something to do elsewhere in your home without confining him to that particular space. You’ll need to train him to stay in his space while you and your family enjoy meals. At first, your dog will be tempted to abandon his designated spot, and come looking for table scraps. Over time, however, you can teach him to remain there, thereby preventing him from begging. This method has the added benefit of being helpful in other circumstances. For example, suppose you’re entertaining guests, and would like to prevent your canine from bothering them. Simply instruct him to go to his designated space while your guests are visiting. As long as he has a few toys to occupy his attention, he’ll be fine. When your dog begs, he does so because he has an expectation his begging will produce results. This is the reason owners who have given in to their canines in the past find it difficult to curb the behavior. But it’s never too late. Use the methods above to turn your begging pooch into a patient, pleasant companion. Of all dog behavioral issues, aggression is the one that most frustrates owners. It is very common, though canines display signs for very different reasons. Many owners observe hostile behavior in their pets, but are unaware regarding its trigger. Consequently, they are uncertain about how to respond. First, it’s important to realize that aggressive behavior is natural to dogs. Though most are domesticated, they remain pack animals, and perceive the world around them accordingly. Second, in order to properly address hostility in your canine, you must first be able to identify the different types of aggression. Once you can determine the trigger, you’ll be better prepared to “cure” the problem. With this in mind, we’ll provide a brief overview of the most common reasons dogs become antagonistic. The following descriptions will offer a springboard from which you can remedy the problem. As pack animals, canines have traditionally protected those within their group from assailants. If an intruder threatens one member, the others will respond quickly to protect him or her. In your home, your dog considers you and your family to be members of his “pack.” If he feels you, your family, or other pets under your roof are threatened by a perceived attacker, he will behave aggressively to warn the attacker away. The problem is, many canines become overly-protective, and consider any person outside their “pack” to represent a potential threat. Similar to guarding their families, dogs also guard their territories. If an intruder approaches their den, they will respond with hostility to discourage that person or animal from coming closer. Canines react to elements that frighten them in the same way as humans: they retreat. However, if retreat is not an option, they will fight. In the wild, if a pair of wolves approach a dog, the dog will initially seek a path that provides him an escape route. If, however, such a path is unavailable, he will turn to face the wolves, despite his fear. Fear aggression is dangerous. If a person unwittingly corners a canine, that person risks being bitten. Thus, always provide an unfamiliar dog a route through which he can escape. Dogs are hard-wired to protect their possessions. While this trait stems from the need to fight for food outside the human-canine relationship, it has carried over to today’s pets. For example, when a person or animal approaches a dog’s food bowl, he may bare his teeth and growl to communicate his ownership. Within your home, your canine may express possessive behavior over his food, toys, and even the area in which he likes to rest. This may become a problem if visitors – either people or animals – stumble upon your pet’s possessions without realizing they have done so. Dogs have always functioned within groups according to their understanding of their pack’s hierarchy. As long as they know – and accept – those ranked above and below them, there is minimal conflict. Conflict arises when there is a bid for authority within the group. This latter problem occasionally happens between canines and their owners, families, and other pets. The dog will compete for authority, and act aggressively when others confront him. Canine aggression can only be addressed successfully after the behavior’s trigger has been identified. If you’re having difficulty doing so, consider working with your veterinarian or a professional trainer.